The Beatles Again — in Osaka, Japan? Want to hear the Beatles? Then have you considered going to Japan. 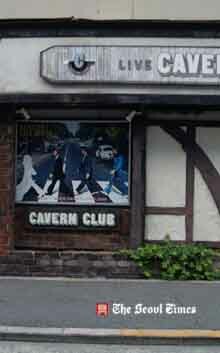 I have never heard as many Beatle songs, in my life, as a recent trip to Osaka. What is it about the Beatles? Why Japan? Walk through the electronics district of Den Den Town, in Namba, Osaka, and you will notice chain stores called /Strawberry Fields /and /Yellow Submarine/. Even – and I am a little bit embarrassed here – the male toilets at Fukushima Station, one stop away from the centre of Osaka, have an odd Beatles reference—designer tiles that say, “Apple pie is a great recipe for everybody who loves the Beatles. Yam.Yam.” It makes no sense, may be it's just hip English – yet still it’s another reference to the Beatles. Please, please, me. Here, there and everywhere: shops, cafes, toilets. Conversations about musical interests even manage to swing toward the Beatles in my regular breakfast visit to the Ura Café, in Fukushima. Kozo Mabuchi, the wonderful host, turns out to be a big Beatles fan. Kozo knows all the albums, has seen Paul McCartney in concert, and loves the solo work of John Lennon. “I have learnt Blackbird on the guitar,” he says one morning. So, what is it about the Beatles? Why am I experiencing this in Japan? Research tells me that the Beatles toured Japan in 1966- never visiting Osaka. The tour became famous because of its over-zealous security, public protests about the band playing the Budokan venue, and the great NHK recording of the Tokyo concerts – this can be seen on Youtube. Then, of course, there is Yoko Ono and the official John Lennon Museum in Tokyo. Japan has also released the greatest number of Beatle album pressings of any country. Wherever I go the Beatles pop up: T-shirts, posters, in cafes. It's all too much. Finally there is the Beatles Cavern Club. ( Listen, do you want to know a secret?) I discover this, by accident, one afternoon when walking through central Osaka. It is an old style British pub nestled among office buildings, bars, cafes and love hotels. What attracts me is the old Tudor style – the cross hatching of wooden beams reminiscent of an English pub. On it wall is a large image of the Abbey Road album cover. Curiously, it is in reverse. ( You can't do that). I decide to visit the club a few days later – cautious that I might see a corny cover band. What I see is a great surprise. It is a quiet weekday evening when I enter and there is no cover charge – just slightly inflated meal and drink charges.The lighting is low. Behind the bar a barman is waiting to serve drinks. A cabinet contains Beatle memorabilia: albums, press clippings and an authenticated brick from the original Cavern Club in Liverpool. A sound mixer is preparing the mixing desk. Toward the front of the room, where several people are sitting at tables - smoking, chatting - is a stage reminiscent of the Beatles: a set up of microphones, guitars and the unique Ludwig drum kit with its simple yet iconic black and white lettering. Behind the stage, crossed by those strange English Tudor style cross beams, are four late career photos of the Beatles. The tribute band that will be playing tonight is called /The Bambies/. I don’t cringe at the name, imagining the cute story of the deer. I am used to these anomalies in Japanese English. I see one of the members of the band – in characteristic gray Beatle suit – and introduce myself. His name is Sasabe Taka-aki. He is the drummer – Ringo. The band will play six songs in each set, two of which are requests. Sasabe is new to the band and has come to the Beatles fairly late in life. It is clear he has many other musical interests and relishes this regular gig. Shortly afterwards the band appears on stage. All members are in gray suits - no wigs, thankfully – and it is clear that the band is not into impersonation but rather capturing an essence of the Beatles’ sound and look. The first few songs include “Drive My Car,” “I’m Happy Just to Dance with You,” “Here, There and Everywhere,” “No Reply” and “Boys.” The audience favorite is “I Want to Hold Your Hand.” It is clear that the early Beatles sound, with its rising harmonies and choruses, is the most appreciated. The playing is tight and inspired. Each member following a style of playing that we associate with the band: McCartney’s Höfner bass, Ringo’s characteristic drum kit, Harrison’s rhythm guitar, and Lennon, leaning into the microphone, sharing with Harrison. I chat to Koutaro Goto, the John Lennon of the band. He is older and a very seasoned player, having played in cover bands for a number of years, covering songs for artists such as Eric Clapton, Jeff Beck, Toto and Sting. “We even played in Tokyo as the Bambies, one and a half years ago,” says Goto. I even get to hear my cheeky request – the lesser known song “Hey Bulldog.” The band plays it extremely well. It becomes clear to me that this song - one of the Beatles oddities - has in fact matured with time. It has a real ‘90s guitar sound, not lost on the young guitarists, who relish the driving guitar riffs and belt out a fantastic version. I am really impressed by the evening’s performance – there is great musicianship. This is not an impersonation, or a ritualistic paid gig. It is a sophisticated interpretation of Beatle music and one that shows a deep and studied interest. While the venue no doubt picks up tourists curious at the English style pub, and an opportunity to see a Japanese Beatle cover band, it is apparent that this venue is also catering for a local clientele. “Thirty percent of the audience is regulars,” says Goto. There is no doubt a small yet solid core of Beatle fans who enjoy an atmosphere in which they can savor the sound, and share like-minded interests. We tend to forget that there have been small yet enthusiastic interest groups in Japan , for many years, who have savored music such as jazz ( see my article on Jazz Cafes) as well as the Beatles. What becomes apparent, as this night progresses, is how much integrity there is in the performance. 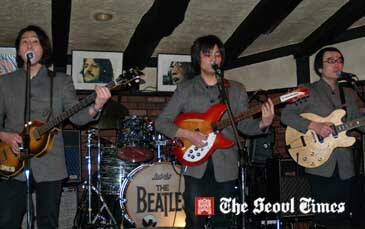 This is something echoed by the international Beatle community - Japan is well known for its excellent Beatle Cover bands. Some kind of happiness is measured out in miles. With other Cavern Club style venues in Tokyo, and bands with names such as T/he Mendips,/ the /Parrots/, the /Bricks/ and the /Silver Beats/, it is clear that the Beatles will not go away. For a country that had a short direct contact with the Beatles there is a deep and long lasting interest.